TAICHUNG CITY > SHOPPING > Jason & Co. Apple Store. Jason & Co. Apple Store. 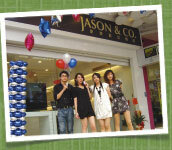 Located within the famous "Little Europe" area, the Jing Ming shopping district, JasonCo. showcases a wide range of Apple computers, iPods, Accessories and Audio/Video related products. The store decorated in a simplistic white theme, which best displays the entire collection of Apple products. In fact, JasonCo. is gorgeous indide and out, and has kept up with an ambiance that is identical to Apple stores in the U.S. Staff members are addicted in Apple style and updated with first-hand information on their products. Furthermore, every year in January, store manager travels to Mac World exhibition in San Francisco to bring back the first hand keynote, photos and other information on upcoming Apple products. Pro staff, Pro service, Pro user group. Since staff at JasonCo. are experienced Apple users, allows them to provide professional service to meet customers different need, and to market their products by sharing personal experiences with customers. Provide solutions to customers who want to purchase Apple products for personal use, or for specific profession such as Photographers, Designers, Audio/Video Producers, as well as various corporations. These friendly staff also provide Mac IT support in English. There are actual demo units in store for customers to enjoy the hands-on operation, not only Apple products bup also variety collection of accessories, you may also try the Mac Pro 8-core workstation and its 30-inch Apple Cinema Display together with digital drawing tablets and digital single-lens camera in store. If you are keen on finding out more about the functions of these sleek and modern gadgets, visit Jason & Co. for further discuss and inquiries. Accessories that go along with stereo systems and demo songs are also selected cautiously, and there will be seminars and workshop in the near future, relating to topics of digital photograpahy, music or post production. in other words, there is a rare community base that connects design, photography, music and computers, so that everyone can get a chance to explore the wonderful world of arts, while enjoying the fun of Apple lifestyle briing to their lives.